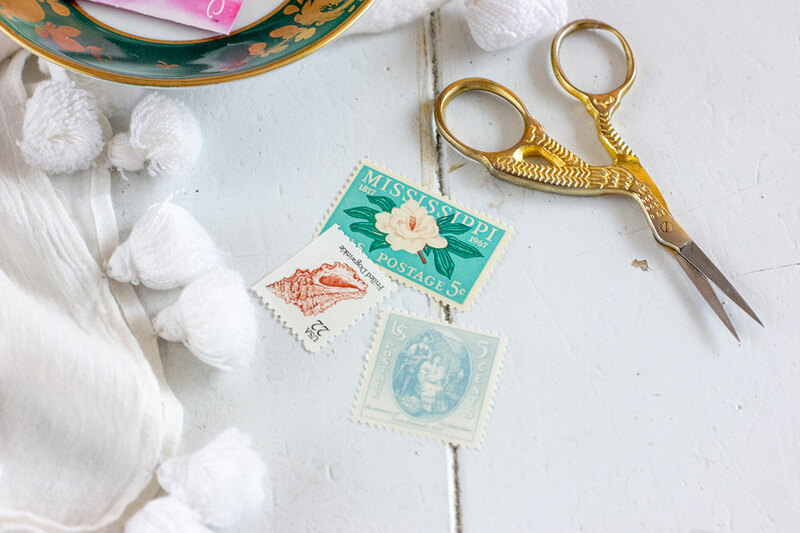 Using vintage stamps or mix and matching multiple stamps for your wedding or party invitation suite envelopes adds that custom touch and makes your invite that much more special! Selecting the right stamps for an invitation design theme is a passion of mine and an important part of my design and styling processes. 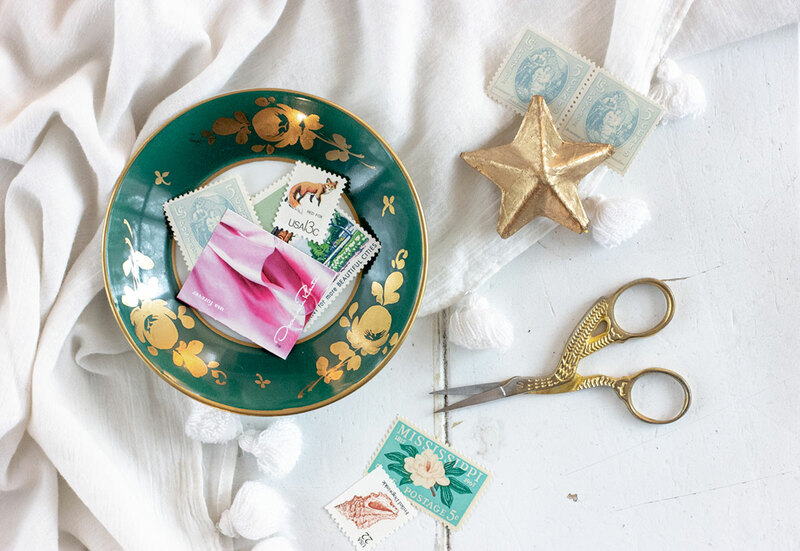 Here are some tips for using vintage postage. 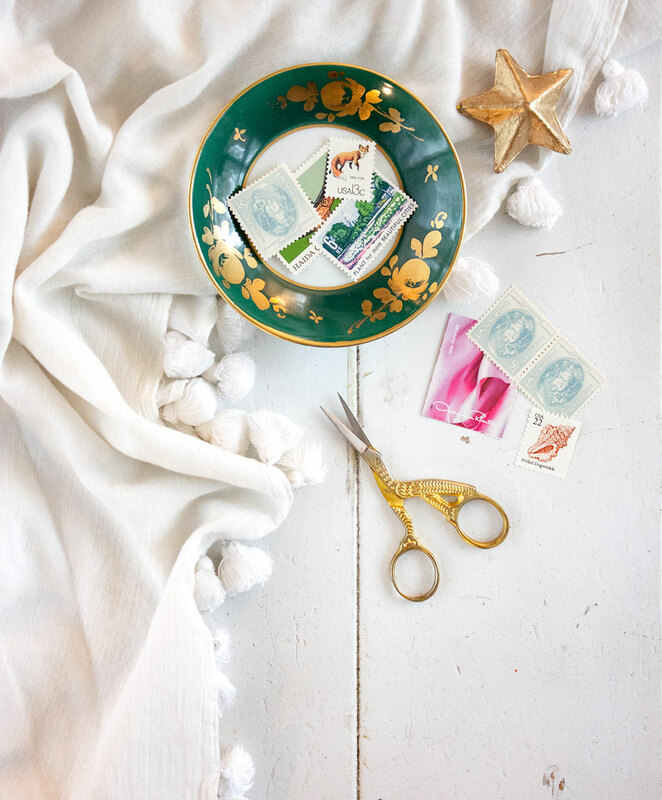 There are lots of great online stores where you can find vintage postage stamps. Make sure to check USPS.com too. Sometimes shops will try to mark up the cost of a stamp that is currently in circulation, so be careful of that. No need to pay more when you can hop over to your local post office to buy a design they currently have. Choose 3-5 vintage stamps of varying sizes. 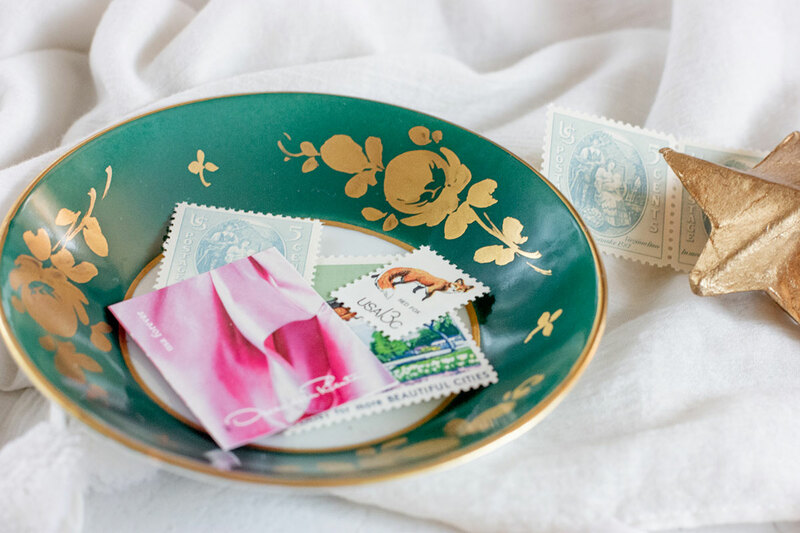 Your envelope size will also help dictate how many stamps you should choose. I’m a fan of 4 usually. Make sure the value of all the stamps you choose adds up to the postage you need to mail the invite! You certainly don’t want your beautiful creation to not make it to its destination because you didn’t include enough postage! To make sure you have enough take your fully completed / sealed invite to the post office to have it weighed. No one wants the nightmare of misjudging the amount of postage you need. Look for colors that go well together or that match your overall invite color scheme. The real magic happens when you can find a stamp that has the right subject matter AND colors for your invite suite. Get clever! Find stamps that come with a design from the state your wedding is in or your state bird / flower. I styled a dinner party once that had a Shakespeare inspired theme and I was able to find an actual Shakespeare stamp. Those are the magic design moments that bring a smile to my face. If you can remember back to the days before stamps were peal off stickers then you can image what I’m going to say next. Yup! Some of your vintage stamps will require you to lick them or use a damp sponge. If you’re doing a large batch of invitations I recommend you use a damp stamp sponge. You can grab one here on Amazon. Your mouth and tongue will thank you later. Be careful with stamps that are older. Some of them might not have much stick left to them and you may need to apply extra adhesive.